Despite a high profile at the centre of Irish political life for more than twenty years, relatively little is known about our new leader. 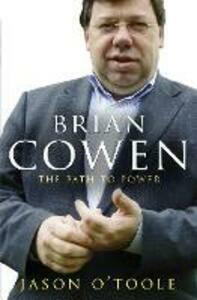 Just who is Brian Cowen? The story begins in the village of Clara, Co. Offaly, where family, local life and the GAA were formative influences. The sudden and unexpected death of his father, Ber Cowen, Fianna Fáil TD for Laois Offaly, thrust a twenty-four year-old Cowen into the heart of Irish politics. After an eight-year apprenticeship on the back benches, Cowen was appointed to his first ministerial position by Albert Reynolds and later went on to hold the senior cabinet positions of Health, Foreign Affairs and Finance. By the time of Bertie Ahern's resignation, Cowen's standing in the party was such that his election to the leadership of Fianna Fáil seemed inevitable. On 7 May 2008, Brian Cowen became Ireland's eleventh Taoiseach. Here, for the first time, is a portrait of Brian Cowen which follows his remarkable life story, tracing the road to power from early childhood right up to his eventful early months in the office of An Taoiseach.